With the 2014 football World Cup in Brazil fast approaching, we've been digging in to Warc's subscriber database of cases, articles and research papers to draw out some consumer and media insights around football's biggest tournament. With much of the world set to follow the action this summer – FIFA research suggests there were 26.2bn cumulative TV views of the last tournament, held in 2010 in South Africa – it's no surprise that World Cup related marketing is a big focus for big brands. Brands and sport in Latin America – a missed opportunity? SABMiller, the beer brewer, shows how its Salva Vida brand helped to revive Hondurans' passion for their national football team as they worked to qualify for the 2010 World Cup in South Africa. (Honduras had not participated in a World Cup since Spain 1982). To reignite the fans passion for their team, Salva Vida engaged popular singer, Polache, to write a song "full of positivism" to fuel hopes that the country could qualify again. The team did qualify. And through smart activation using music and social media, the brand's market share rose from 7% to 35%. According to Randy Ransom, Senior Commercial VP at SABMiller in Latin America, the brand is preparing to launch similar campaigns during Brazil's 2014 World Cup and the 2016 Olympics. 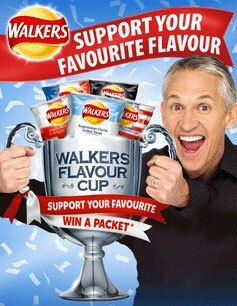 In May 2010 PepsiCo's Walkers crisp brand launched the 'Flavour Cup'. The campaign was inspired by the approaching World Cup and had consumer participation at its heart. The idea was to find the world's greatest crisp flavour by staging the Walkers Flavour Cup in which 15 flavours competed to be crowned the world champion crisp. The campaign generated social media buzz, consumer participation and earned PR. The campaign involved the creation of 15 new flavours with Welsh rarebit coming top of the league. Following poor returns from its 2006 FIFA sponsorship, Hyundai America wanted to see significant impact from its 2010 World Cup sponsorship. The challenge was to position the brand alongside more established sports marketers and boost car sales despite a 25% cut in the marketing budget. Shifting from a traditional logo/signage sponsorship, the auto brand adopted a more innovative approach. Hyundai wanted to encourage people to get more involved with the game, learn more about soccer and generate excitement. A multimedia campaign told stories about fans' loyalty to their team. Fans were encouraged to celebrate and share their loyalty stories across a range of social media. And in New York's Time square fans could answer loyalty quiz questions via text, or text their loyalty to a country, and within seconds, it was reflected on the digital screen, for thousands to witness. Not only did Hyundai become the No. 1 brand for World Cup buzz but it had a 4.4% increase in car sales, representing additional revenue of more than $20m. Coca-Cola, the soft drinks company, needed to produce a global strategy that also resonated in local markets for the 2010 World Cup. It used the song "Wavin 'Flag" by African singer K'naanas as its global tournament anthem which incorporated the celebratory, elongated cry of "Goal!" that was played whenever the national soccer team scored a goal. The artist and song went on Coke's World Cup Trophy Tour (including 50 countries in Africa), and the song ended up at number one in 17 countries. Ultimately, according to the brand metrics Coca-Cola's sponsorship ranked third, behind two sports brands, despite being outspent by six fellow sponsors; and Brand Love scores among teens increasing two percentage points. 2010 World Cup activity was the "largest executed programme by any company in history", according to Joseph Tripodi, the soft drinks maker's Executive VP and Chief Marketing and Commercial Officer. The campaign was executed in more than 160 markets, and the idea was to use both scale and compelling storytelling. Looking forward to 2014, Coca-Cola believes start-ups can give its brand marketing a competitive edge. Warc subscribers can find out more here. Powerade, the Coca-Cola owned soft drinks brand, saw the 2010 FIFA World Cup as the perfect opportunity to raise the brand's global voice and reinforce its credentials in sports. To drive participation and trial, the brand kicked-off experiential elements at local football pitches. Utilizing billboards around the pitch and providing Powerade bottles to players, those watching the matches couldn't help but see the Powerade brand. Finally, Powerade unveiled a digital program on fifa.com, the website of the World Cup's organisers, with collectible clips from the 2010 World Cup matches. But the main driver of reach for the campaign was a TVC that solidified the performance and endurance message. Print and OOH also drove reach and focused on 'hero-ing' Powerade's performance abilities. This strategy established the brand as the go-to sports drink for footballers the world over. The brand was able to activate the global campaign across the top twenty Powerade markets. In a first for both Anheuser-Busch InBev (ABI) and FIFA, ABI negotiated global sponsorship using 10 different brands across 54 countries. For the 2010 World Cup campaign, just 25% of media spend went on TV, with the rest allocated to digital channels which incorporated an international 6 vs. 6 tournament, with teams created on Facebook, with the finalists playing in South Africa and a worldwide, real-time voting system for Man of the Match. Lacking the massive marketing budgets of its competitors, DiGi, a Malaysian telecoms brand, needed to find an innovative way to stand out among football fans. It wanted to drive traffic and football fans to a billboard/event site during the World Cup. So the "Bola! Bola! Bola! Living in a Billboard" campaign was born. The live-in billboard housed Malaysia's top radio stations and popular DJs over several days, and the campaign generated PR estimated at $3.2m. Vivo, the largest mobile telecoms carrier in Brazil, had sponsored the Brazilian national soccer team since 2005. But prior to the 2010 World Cup it was facing competition from a rival sponsor of a large media package. Vivo therefore needed to generate brand visibility without the same media support and engage consumers with the Vivo brand through soccer. It did so through the production of an online film – 1284 – released onto YouTube which featured the iconic Brazilian soccer player, Pelé. It depicted him scoring his last (1284th) goal of his career for Brazil – something the player had dreamed of doing in real life but never achieved (since his actual final goal was for a US club). The film generated 2m views online together with large amounts of earned media across digital and traditional channels. A study of the top 10 brands that created buzz around the 2010 World Cup in Vietnam found that six of the top 10 brands were not official sponsors of the tournament. Coca-Cola scored highest association, largely due to the aforementioned song, and it also brought the actual World Cup trophy to Hanoi and Ho Chi Minh City. Interestingly non-sponsor Tiger Beer, ranked third, it created strong buzz around the event by using high-profile European players, specifically, England's Wayne Rooney. Pepsi scored the second-highest association with a TV ad featuring footballers such as Didier Drogba, signally the power of celebrity. Other official sponsors like Castrol, the oil company, performed poorly despite heavy investment perhaps due to the brands weak connection with the game. This case study conveys how, ahead of the 2010 World Cup, adidas, the sports brand, developed a strategy in Japan to inspire people and to enable them to participate in the World Cup by letting them become part of the team. It did this by focusing on schools and regions where the team's members came from and having them take part in the creation of the world's largest comic strip, which the team was able to view from their aeroplane as it departed to South Africa. Brand equity scores for adidas rose and sales of adidas-branded national team jerseys increased by 22%. Microsoft, the internet giant, wanted to promote its "decision" engine, Bing, to football fans during the 2010 World Cup. To achieve this, partnership was forged with social media platform, Foursquare, and urban recommendation newsletter, Thrillist, to provide bars to watch matches in, sorted by country-by-country loyalties. Of course, you don't have to be an official World Cup sponsor to get noticed as a brand. There's always the option to try some "ambush marketing". Bavaria, a small Dutch beer brand, wanted to attract attention and cut through all the other promotional material surrounding the event. Gift items were predominantly aimed at men, but Bavaria looked to reach both beer-drinking men and fashion-sensitive women with the DutchDress: an orange dress marketed as a fashion item. Flashmobs of attractive DutchDress-clad women were sent into stadiums during practice matches, generating positive media attention. This tactic was repeated in South African stadiums during the tournament. Sales of Bavaria cans rose faster that the market in 2010: 41% versus 12%; Bavaria's top-of-mind brand awareness and preference doubled in July 2010 compared to March 2010. 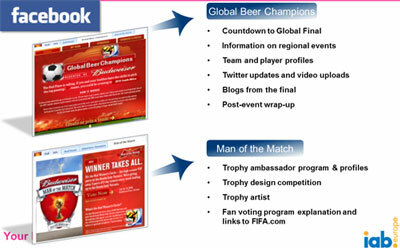 The Bavaria promotion was unofficially declared 'best promotion of a non-sponsor during the World Cup 2010'. Lena Roland is Managing Editor, WARC Knowledge at WARC. Previously, she has held marketing intelligence roles at the IPA and DDB UK.